Inner Health; Flu or Cold? Are you fighting the flu or cold? One of the worst things about the winter season is the passing of germs from family member to family member and friend to friend. As much as I miss my family while I'm away, there are times when I'm glad I'm not around. :~) Now, is one of those times! Two weeks ago my brother's family had the dubious pleasure of enduring a very nasty flu bug (probably picked it up from friends at church). Of course, they unintentionally generous and passed it on to my sister, brother-in-law, and their brood of 9 children. They are still passing it amongst themselves (as you do). This particular flu virus brings at least 24 hours of unpleasant nausea and vomiting, and let's not forget the continual diarrhea. If you happen to be one of the lucky ones, you get to enjoy the misery even longer. In fact, Heather told me today that it appears you can get this one at least twice, as one family member is experiencing round two! I'm not really making light of their suffering, but sometimes you just have to laugh or you'll cry. I am, of course, praying for their swift recovery and trying to keep them supplied with vitamins and nutritional supplements to help boost their immune system. In most cases, having flu or cold symptoms is not life threatening, just very unpleasant and inconvenient. Apart from the personal discomfort, it can mean loss of work or the ability to perform your regular daily responsibilities. For some people, though, catching the flu can be extremely dangerous, depending on the particular virus strain to which they are exposed. This generally applies to people who have a pre-existing condition or a very low immune system. Their natural body resistance is low and unable to fight off the flu virus effectively. What Can You Do To Boost Your Immune System and Avoid A Flu Or Cold Filled Winter? Although it's almost impossible to avoid being "exposed" to the viruses, bacteria, and germs that float around every season, there ARE steps you can take to reduce your risk of suffering from the seemingly inevitable symptoms. First Step: Boost your immune system! The stronger your immune system is, the less likely you are to suffer from the effects of the common cold or the flu. Your body is able to identify, attack, and eliminate unfriendly bacteria so that may not even realize you were exposed. At the very least, a strong immune system will allow you to bounce back much more quickly and lessen the severity of your symptoms. Good nutrition is key in maintaining a strong nutrition. You can supplement your nutritional intake with whole food powders like the Garden Trio or Leaf Greens. Keep your Omega levels up, too. You can do that by eating healthy fish and whole grains, and using healthy oils. Or, you can use Omega supplements like AIMega. Second Step: Eliminate Internal Germs Quickly! Even though you can't help coming in contact with the germs that cause flu or cold symptoms, you can help your body pass them as quickly as possible. Garlic is a great natural anti-fungal and anti-parasitic. Eat a little garlic regularly or take garlic capsules throughout the flu and cold season. I like Bear Paw Garlic if I'm not eating garlic regularly. My absolute favorite "germ eliminator" is Herbal Fiberblend. I don't usually take HFB on a daily basis unless I'm doing a proper cleanse (like I am now), but I ALWAYS keep it on hand year round. Any time I know I've been around people who've got the flu, or it's "going around" in my area, I take a teaspoon (or a few capsules) of HFB. 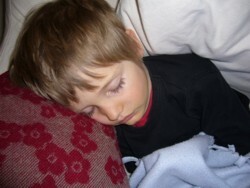 It's my little secret weapon against the parasites that lead to flu or cold symptoms. Okay, I know I've given you a lot to think about, and maybe you aren't able to take on board all of these healthy suggestions. Let me simplify it for you even further and give you a good place to start. Get the basic Body Booster Starter Pack! With the Body Booster Starter Pack, you get 4 great products - 3 whole food powders for immune boosting support and 1 HFB for cleansing defense. Not only do you get the low wholesale prices, but when you get the Body Booster pack you get an additional discount, receiving all four for only $115.00. If this is your first order, you'll also get Free Shipping as an added bonus to help you get started. 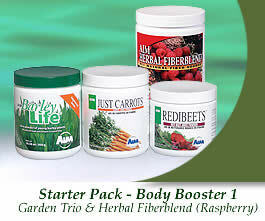 Do yourself and your family a favor and Order your Body Booster Starter Pack Today! I hope you and yours can live the rest of the winter season free of flu or cold symptoms and enjoying the benefits of good health!